Here in Vancouver, temperatures have climbed to the double digits and we're enjoying a stretch of sunshine and blue skies—spring has officially sprung! The warmer temps not only have me craving more time outdoors and pretty dresses, but a change in my beauty routine. Think lighter textures in my skincare, more SPF, and energizing and invigorating scents in my toiletries. That's where Scentuals Natural & Organic Skin Care comes in: A box of their all-natural, divinely scented skin and body care goodies landed on my beauty blogging desk a couple weeks ago and I've been enjoying three of the products in particular. If you're new to Scentuals like I was, here's what you need to know. 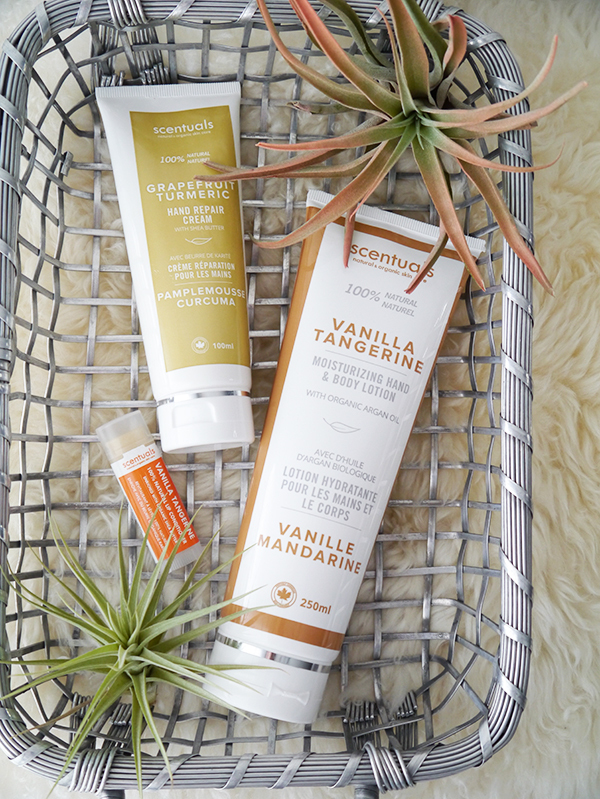 Scentuals's all-natural products are made in Coquitlam, BC in small batches. The line is quite extensive and includes skincare, bath and body, and aromatherapy. Some products are gluten-free and/or vegan, but not all. Although the skincare can be more expensive, most of the other products hover around $20 a pop, which puts Scentuals on the relatively affordable end of the natural beauty spectrum. 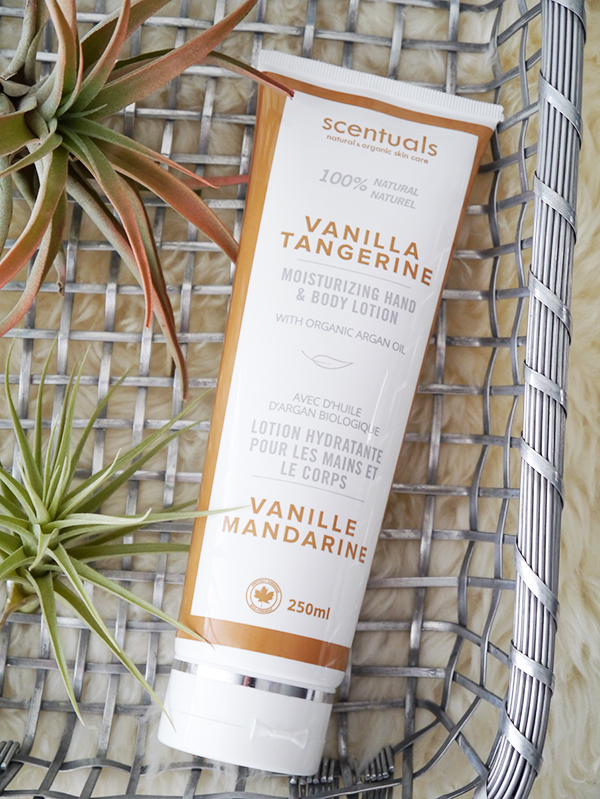 The three Scentuals products I'm featuring in this post are all moisturizing and citrus-scented. Although I've only been testing them for a few weeks, I feel confident recommending them because they work and they have great scents and textures. The scents of all three products—grapefruit, vanilla, tangerine—complement each other and leave me smelling like an orange creamsicle. What more do you want of a body lotion, hand cream and lip balm? If I had to pick a favourite among the three, this hand cream would come out on top. This lotion contains shea and cocoa butters and aloe, and is so rich and nourishing I sometimes rub some on my feet and put on socks for an overnight dry heels SOS treatment. It dispenses thick and creamy and absorbs quickly with a non-greasy texture, but I still feel it sitting on top of skin in a thin waxy layer like a protective veil against the cold and wind. 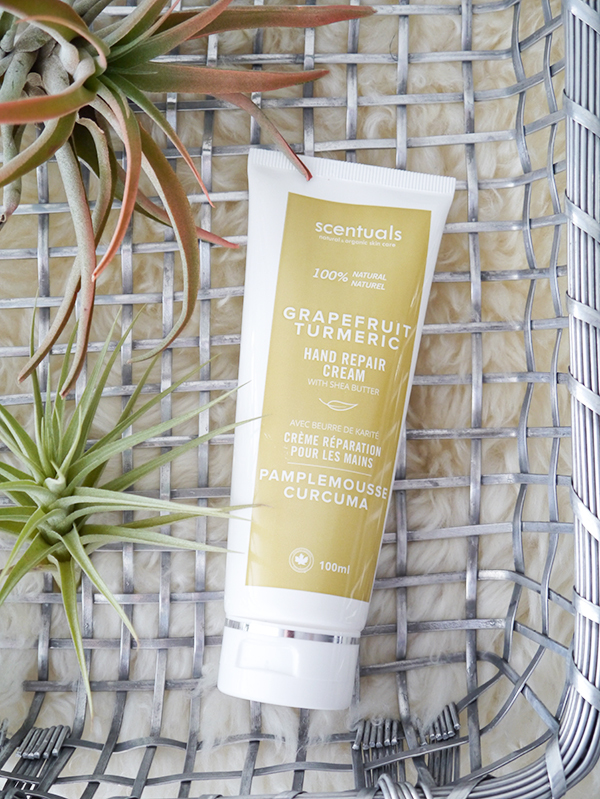 The grapefruit scent is so invigorating to the senses every time I re-apply, and so delicious I can't help sniffing my hands for an aromatherapeutic mood boost. The turmeric lends the grapefruit a spicy depth and tints the hand cream the palest shade of yellow; I was worried it might stain fabrics but that hasn't been the case so far. My only quibble with this product is that it doesn't come in a travel size. The hero ingredients of this body lotion are organic olive and argan oils and aloe juice. It's thinner in texture and not quite as rich as the Hand Repair Cream, but still effective on dry elbows and knees and legs. I love how it smells like an orange creamsicle; the fragrance does dissipate throughout the day, but it doesn't disappear completely and does get stronger when I'm working out and sweating. This looks like a typical stick lip balm, but the all-natural formula is chock full of nourishing ingredients: cocoa seed butter; beeswax; coconut, castor seed, jojoba seed, avocado and vegetable oils; shea butter; vitamin E. It glides on effortlessly and in a thicker coat than other natural lip balms I've tried like Burt's Bees and EOS, and it lasts a surprisingly long time—I've applied this before bed sometimes and still felt a residual veil of product on my lips in the morning. 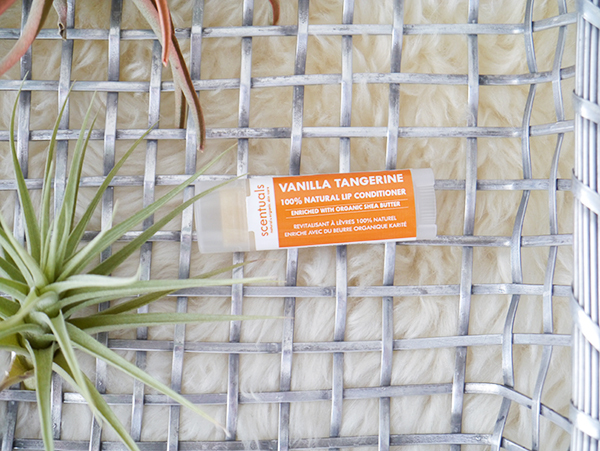 Like the body lotion, this is vanilla tangerine-scented and yes, it also smells like an orange creamsicle. Your biggest difficulty will be resisting the temptation to lick it off your lips.